BIRMINGHAM, AL (WBRC) - It's a parent's worst nightmare. 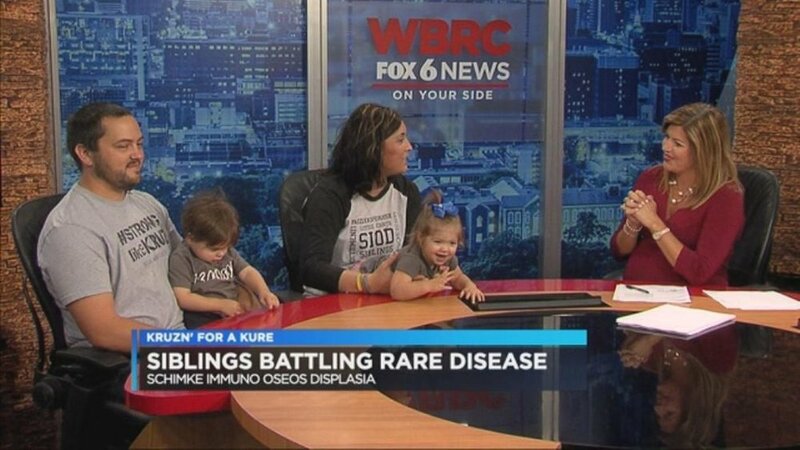 This summer, a family in Muscle Shoals found out her son and daughter have the same rare disease. It's so rare that there are only six confirmed cases in the U.S., which includes Kruz and Paizlee Davenport. Kruz, 3, and Paizlee, 1, have the energy of any child but inside they're fighting a deadly battle. They've been diagnosed with Schimke Immuno Oseos Displasia (SIOD), a rare form of dwarfism. SIOD impacts their immune and vascular systems, which means a common cold could be deadly for these two. Perhaps the most devastating is that their life expectancy is only nine to 11 years. Their mom, Jessica Davenport, is not giving up without a fight. After her son was diagnosed June 30, she set up a foundation called Kruzn for a Kure. Her goal is to raise $100,000, which would jump start a research program for SIOD. There are two upcoming events planned to raise funds. The first is a Ride for a Cure at Wilson Park in Florence on Oct. 8 at 10 a.m. and the second is a Darryl Worley concert at the Alabama Music Hall of Fame in Muscle Shoals on Oct. 29. For more information and to follow their journey, visit https://www.facebook.com/KruznforaKure/.